The Class of 1984 attends that year’s Commencement ceremony in Gettell Ampitheater on campus. Since its construction in 1961, the Gettell Amphitheater has been one of Mount Holyoke’s primary sites for community gathering. 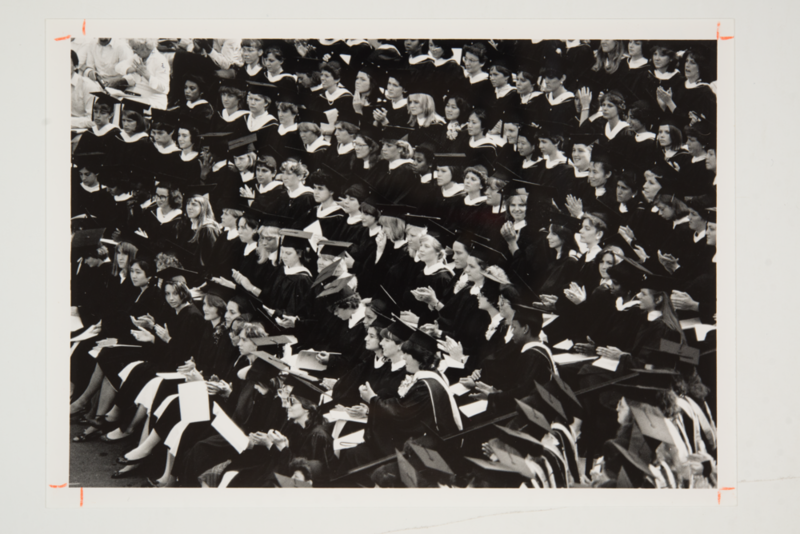 Students annually celebrate Convocation and Commencement from its benches, as well as less formal traditions like the Orientation screening of “Dirty Dancing.” Its stage has hosted numerous influential speakers, including Martin Luther King, Jr., Shirley Chisholm and Dolores Huerta, according to the Mount Holyoke College Archives and Special Collections. However, the inaccessibility of the amphitheater has necessitated an alternative location for Mount Holyoke’s biggest event. The 2018 Commencement ceremony was the first to be held in the Field House rather than the amphitheater in 57 years (with the exception of ceremonies moved inside due to inclement weather). President Sonya Stephens’ inauguration ceremony in the fall was also held in the Field House. In an email sent out to graduating students, Lenore Reilly, Senior Advisor to Stephens, responded to concerns about the transition. Reilly explained that the design of the amphitheater does not comply with the Americans with Disabilities Act (ADA). Additionally, the limited space of the amphitheater makes improvements challenging. While the primary accessibility consideration involves access to the stage for those with limited mobility, Reilly also cites concern for those with sensitivity to sunlight or who need convenient access to restrooms during the ceremony. “While it was suggested that the senior class should have been able to vote on this matter, our responsibility to plan and hold an event that is fully accessible to all of our students and families is not a matter that is up for vote,” wrote Reilly. President Val Montesino ’19 and Vice President Relyn Myrthil ’19 of the 2019 Class Board were consulted about the move and reached out to the graduating class via email. While they expressed disappointment at the end of a tradition, they affirmed the decision to move the ceremony. In addition to increased accessibility, the Field House offers more accessible parking and more tickets for families of graduates. Montesino and Myrthil also explained that alternative locations, such as Chapin Auditorium, Willits-Hallowell Center and Skinner Green have insufficient space for all of those in attendance. Sarah McCool ’18 graduated last year in the Field House. Overall, she understands the rationale behind a new venue for Commencement. “When I think about it from a point of accessibility for students, I think it’s a good idea,” she said. But, McCool didn’t disguise her disappointment over the aesthetics. “Is it uglier? Absolutely,” she said.